"Anybody who thought [Cuil] was this Google killer can really see now that no, that's not going to happen today  and the likelihood is that's not going to happen a year from now," says Danny Sullivan, internet search guru and editor-in-chief of SearchEngineLand. Despite its lackluster performance, Cuil (which means wisdom or knowledge in Gaelic) got so many visitors on Monday, that its servers crashed around 3 p.m. E.T. "Due to excessive load, our servers didn't return results. Please try your search again," the site read intermittently throughout the afternoon. But even when it was working, the results were fair, at best. Enter a keyword such as "mint" and the first result that comes up isn't the herb or flavor but the U.S. Mint. Type in "Obama," and one of the sub-categories Cuil suggests is "Hispanic-American Politicians". And Cuil lacks the special tabs for news, video, local and image results used by the leading sites. The hype over Cuil, in fact, may be testament to the power of a great back story. Cuil is the brainchild of ex-Google staffer Anna Patterson  who developed the TeraGoogle indexing system that Google still uses today  and her husband Tom Costello, who developed search engines at Stanford and IBM. 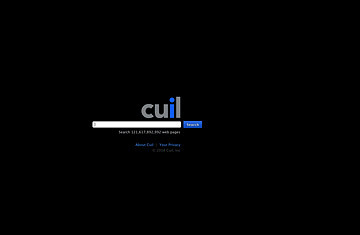 Cuil indexes some 120 billion Web pages. (Google, on the other hand, claims to scan more than a trillion pages, but only indexes those that are useful, according to the company.) The Cuil team generated so much buzz for its venture that it managed to raise some $33 million in financing. But the acid test of any search site is the results it generates, and for now, anyway, Cuil falls way short of the industry's leaders, and even, for that matter, of many startups. Cuil's distinctive design, in which results appear in three columns across the page, also allows for longer previews of each site's content. But other search sites make better use of page real estate. SearchMe, which launched earlier this year, offers full-page snapshots in its results, through which you can flip like the album covers on iTunes. And the No. 4-ranked search engine, Ask, also uses a wider layout to display both images and sub-categories for refining one's search. Cuil has a distinctive, if old-fashioned, approach to indexing websites. Instead of ranking them based on popularity, as Google does, it focuses on the content of each page. That may make sense in theory  after all, the most popular restaurants, for example, rarely serve the best food  but it is precisely the model that Google broke away from in order to give users more relevant results. That could explain why a Cuil search on "insomnia" directs the user to the American Insomnia Association rather than to the Wikipedia entry on the subject pulled up first by most other search engines. The one area where Cuil excels, however, is user privacy. Whereas Google stores user-specific searches for up to 18 months, Cuil never stores personally identifiable information or search histories. Privacy has become a growing concern among users of search sites ever since America Online inadvertently released the searches of 658,000 of its users in 2006. But that's unlikely to be enough to persuade most users to switch from their search engine of choice. "Anybody who thinks the next Google killer is going to come along is banking on something that's unlikely," says SearchEngineLand's Sullivan. But if the Cuil story is any indication, that won't stop people from spending fortunes on trying to beat the odds.